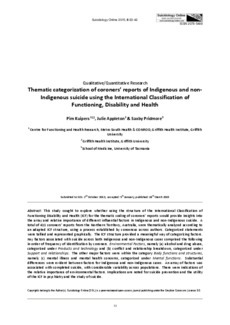 This study sought to explore whether using the structure of the International Classification of Functioning Disability and Health (ICF) for the thematic coding of coroners’ reports would provide insights into the array and relative importance of different influential factors in Indigenous and non-Indigenous suicide. A total of 411 coroners’ reports from the Northern Territory, Australia, were thematically analyzed according to an adapted ICF structure, using a process established by consensus across authors. Categorized statements were tallied and represented graphically. The ICF structure provided a meaningful way of categorizing factors. Key factors associated with suicide across both Indigenous and non-Indigenous cases comprised the following in order of frequency of identification by coroners. Environmental Factors, namely (a) alcohol and drug abuse, categorized under Products and technology and (b) conflict and relationship breakdown, categorized under Support and relationships. The other major factors were within the category Body functions and structures, namely (c) mental illness and mental health concerns, categorized under Mental functions. Substantial differences were evident between factors for Indigenous and non-Indigenous cases. An array of factors was associated with completed suicide, with considerable variability across populations. There were indications of the relative importance of environmental factors. Implications are noted for suicide prevention and the utility of the ICF in psychiatry and the study of suicide.